Sake rice, a raw material for sake, is indispensable for sake brewing. 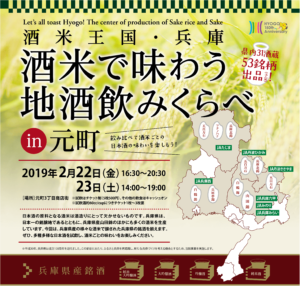 Hyogo Prefecture is Japan’s most important inscription mark, and in addition to Yamada Nishiki from Hyogo Prefecture, we produce a lot of sake rice. This time, I will arrange Hyogo prefecture sake brewed with various sake rice from Hyogo prefecture. By all means, please taste a wide variety of sake and enjoy the taste of each sake rice! We also opened a food and drink booth using Hyogo prefecture-made ingredients that match sake. Please enjoy the collaboration of food and sake. * Tasting of Japanese sake is ticket system! ※ Please purchase tickets at the ticket sales office in the hall.